This is what I will be doing today — we are having our Easter dinner at my MiL’s! Hurrah for someone else doing the cooking!! 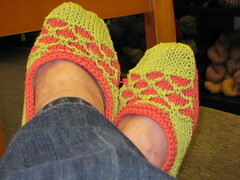 Why yes, that is another pair of the Mother’s Day Cotton Slippers – this time they fit me. I highly recommend this project – quick, slightly fancy and a stash buster too! Not to mention, they are very comfy indeed. Can I just say this Easter-in-March business is a bit unsettling? I am not feeling very spring like – and an early Easter feels as forced as the forsythia. My Easter felt off-season, too, but in the opposite direction. We’re in California and had a high of 70 today. 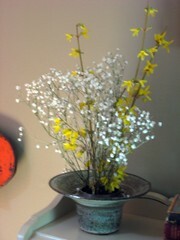 Forsythia here has started to fade. Hope yours opened. the slippers look bright and festive, at least. Nice! I’m making a pair as a gift inspired by your last post! These are fun to knit too! I downloaded the pattern, and I’m making a pair. Yours are gorgeous.